For some time now I have looking at a sail rig for my MadRiver Explorer 14, not just a down wind sail but something a bit more effective, yet simple to set up and use. Having looked at various option, and had a chat with a sailer friend (thanks Tony) I had made my decision. Using my existing poles I decided to use an old fly sheet from a 3 man tent as a starting point, knowing I would probably make a second one, having learnt from the first. My dad, who is into his word work gave me a hand with the mast foot and the support point. This is the Mast Foot, it is made from a side piece of a crown green bowling ball. It was shaped to fit the bottom of the boat. This is in place, along the centre line of the boat, behind the back of the front sheet. This is the mast support, which is screwed to the underside of the front seat, with the mast support at the back of the seat. The extra holes are only there to remove some weight from the piece of wood. This is the mast support in place. This is with the mast in place. It is very important to get the pieces in the right place, central to the line of the canoe, and having the pole upright. The second pole goes into a pocket on the top outer corner of the sail, then it is tied in place, bottom, by the mast. Outer edge bottom of the sail is a line to control the sail and angle it. I am already thinking of a better way to hold the second pole in place to support and control the sail. Also thinking of a different shape to catch wind, but will need to talk to my sailing friend again. This is me sailing with the above rig a few weeks ago, it worked really well, I was quite pleased . I like your mast foot, A bowling ball is made out of nice dense wood. Your mast thwart looks ok for when you are running with the wind as the mast will be pushing against the seat. But if you try sailing into a strong wind the forces might split the short grain out of that nice looking curve at the back of the thwart. When I started I thought it may be a bit on the narrow side, but will have to see. It is about 3/4" inch thick so this may compensate. Will let you how it goes when I get in a strong wind or gust. I bought an expedition rig off Solway Dory (thanks, Dave), and very fine it is too. But I love the do-it-yourself, especially your bowling ball mast foot. I recently gave in and purchased 'Canoe Rig, The Essence and the Art' by Todd E. Bradshaw. It arrived the other day and I've been enjoying reading it and browsing the illustrations. It sprang to mind as soon as I read your post above as it offers a fairly comprehensive range of suggestions for different traditional ways to rig a canoe. Do you think you'll add a lee board for upwind capability? Thats a neat idea,I was looking at seat/thwarts built together. I wonder if that holder could be made or something similar in stainless? Then screwed to the side if the seat. Or maybe made of wood and when needed for sailing it is strapped to the seat with a mast "tube" running to the floor of the boat. See how the rig goes as is, and might try a Lee board when I have done the new sail and tried it a few times. One thing not mentioned yet is the distance between the mastfoot on the floor and the mast thwart, which in this case is the bottom of the seat. The closer these two points are together, the greater the leverage forces are and the greater risk of something breaking in a gust. Also, most canoe seats are on hangers below the gunwales and the strength is generally downward taking the weight of the canoeist not in a fore/ aft or sidways direction. Would it not be easier to drill two holes through the gunwales and bolt a sailing thwart in place with a couple of bolts and wingnuts? It would be easy to remove, stronger and wouldn't risk any damage to the seat or seat hangers. Just a suggestion. The distance between the mast foot and seat did occur to me, but it is a balance between this distance and a sailing thwart higher up. I decided to start with this configuration and go from there. 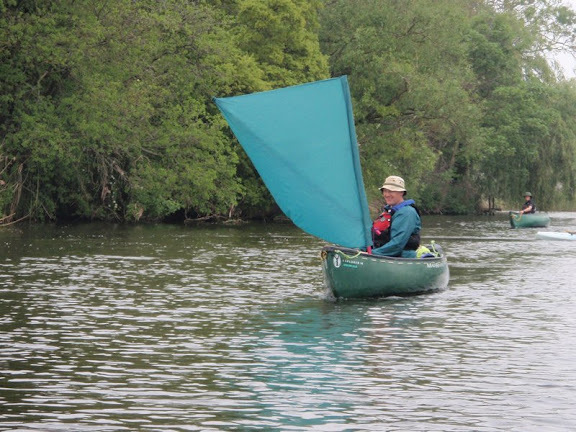 The key disadvangtage for me in having a sailing thwart is the position close to the seat and the paddler there when the rig is not in use, and I did not want to move it back down the boat any further. I have been thinking about moving it further forward, right up to the airbags at the front of the boat, have seen this done before and it is quite effective and allows for a larger sail. Will leave as is and see how I get on with it as is. Great to have so many different thoughts on the subject.